so that they can smile brightly. A clean and safe environment is a requisite for a happy life, but human beings of today are threatened by abnormal climate, destruction of ecosystem, rising sea levels and desertification due to environmental contamination. The Clean WORLD Movement is an advanced environmental initiative to create a happy world by providing a clean and safe environment. “WORLD” is an acronym for Water, Oxygen, Region, Life, and Descendants—components of environment. This shows our determination to have a clean and safe environment not only for ourselves, but also for our descendants. As of 2013, more than 120,000 members in around 500 regions in over 50 countries of the world are participating in this movement. All people, who are living together in this planet, are like one family. Many of our family members, however, are suffering from unexpected disasters, poverty as well as abnormal climate change. 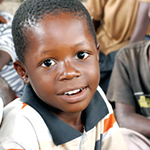 Children in Africa are drinking contaminated water and they are infected by parasites and waterborne illnesses. Seeing them cry out with pain, their mothers just shed tears. Some people have lost their homes owing to sudden disasters and children do not have school bags, note books and pencils though they want to study. This is why we are here; we deliver the love of a mother to those weary people. In Ghana, DR Congo, Kenya, Cambodia, Laos, and India, we search for veins of water, drill boreholes and install water pumps and storages. For people in these water-scarce countries, clean water is more than thirst quencher—it is a miracle of life. We also support children with school supplies and aid schools to improve facilities. For children who lost their families in the aftermath of earthquakes, we provide relief goods and help them receive medical treatment. We help our global neighbors by providing medical expenses and based necessities. We donate school supplies and facilities to provide a better learning environment for all children in the global village. Filial piety is the source of all virtues. As we respect the elderly people who have devoted their lives to their families, we hold consolatory parties for senior citizens and take care of them. Hoping that our global neighbors will regain hope of life, we provide relief supplies, funds and medical expenses.